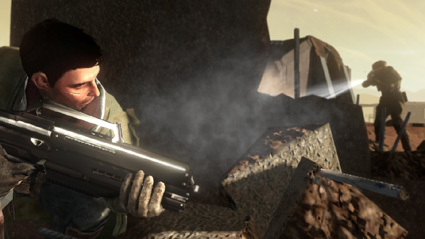 From first person shooter to third person shooter, Red Faction: Guerrilla transforms the series into an almost sandbox like experience in this open-world shooter. 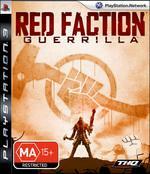 With strong links to the previous games, the game is set 50 years after the original Red Faction game. The story parallels the classic Arnold Schwarzenegger film Total Recall where Earth is dictating to the Martians and in Red Faction: Guerrilla, the oppressive force in this game is the Earth Defence Force. From the very first moments of play, you immediately know that you are in for a treat from the spectacular pre-rendered cutscenes to the amazing in-game graphics which are unparalleled in terms of eye candy and scope. The story immediately throws you into a world gone made and when your brother is murdered by the Earth Defence Force troops, you are found guilty by association. Unwillingly you are forced to join the resistance on Mars who are called the Red Faction and from there, you need to assist in the liberation of the planet. From peaceful engineer, you are turned into a professional guerrilla who does not take no for an answer. The gaming environment in the game is massive and the developers have successfully managed to capture the vastness of the Martian planet from the very look of the rough, barren and reddish coloured landscape. Of course in the future, mankind has successfully terraformed the planet which means man can now breath without the need of special breathing apparatus. Unfortunately for the miners of Mars, The Earth Defence Force hold the planet in an iron grip with a shoot first and ask questions later mentality. Your role as Alex Mason is simple, assist the newly re-established Red Faction from loosening the grasp of their oppressors and if this has to be done one brick at a time, so be it. With that said, the destructible environment of the original game makes a thoroughly welcome return in the third game as players can use a variety of items from futuristic Thor-inspired sledge-hammers to knock buildings apart, explosives or weapons. Needless to say, it’s a very satisfying experience, however once you start the destruction, the forces of the Earth Defence Force come into play and this does become tricky. 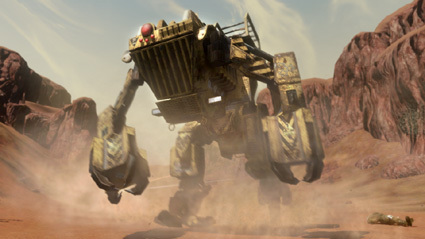 In terms of open world play, gamers can explore a vast area of Mars, however thankfully these are limited as only certain areas are accessible to the player. You can steal vehicles, enter buildings and explore on foot, with gun in hand and sledge-hammer in the other, it's so much bloody fun to reign mayhem on your oppressors. 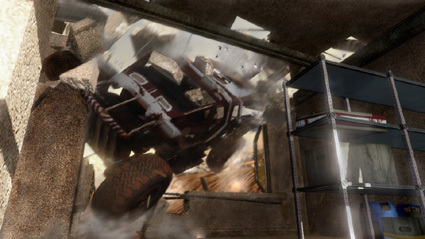 In reference to vehicles, the game contains a variety of 4WD or pickup type vehicles, trucks, tanks and other interesting and futuristic vehicles. Best of all, each of these handles quite differently. Your actions in the game also raise the moral of the locales and by destroying the buildings of the Earth Defence Force, some of these Martians will even join in for some basic squad mechanics. As with Grand Theft Auto IV, your character has a red or green alert on your GPS with green meaning your safe and red meaning your wanted by the EDF. When your red, the EDF are out in force to get you which makes it quite exciting as your trying to get away either on foot or a vehicle. Your missions are generally located from a hidden base in Parker, a large area of Mars where you can restock your ammunition, create new weapons thanks to “salvage” which is found by destroying buildings and of course be given missions. Missions are also available throughout the map which can be located from your GPS. Simply by selecting "select" in your controller, this will bring up a map with a variety of different icons from safe houses, red faction missions, places of interests and areas to demolish. Click on the location and this will add it to the GPS with a nice yellow breadcrumb trail. It should be noted that salvage is the key to the game, however can be quite painful to collect as you need to run over the pieces to be collected. A small price to pay that actually does come useful later on in the game. The game uses a breadcrumb technique to assist on your missions, giving you a clear path to where you are headed. Missions are sometimes given through your radio and this helps break up the sometimes monotony of destroying everything. Even so, blowing things up is a pure treat and after 20 hours, I’m still having fun. At times, the game feels like a futuristic version of Grand Theft Auto due to the amount of interactivity in the game such as rescuing rebels, finding a truck or vehicle to escape and then making your route to home base, all while the Earth Defence Force are on your tracks. Exhilarating fun! And yes, you can control a mech and even a jetpack later on in the game. In reference to controls, they are perfectly mapped on the DualShock controller and the learning curve is quite low as the game does not throw you into the deep end all at once. The force feedback of the controller is used quite well with the gaming environment for that additional realism... a perfect control system. 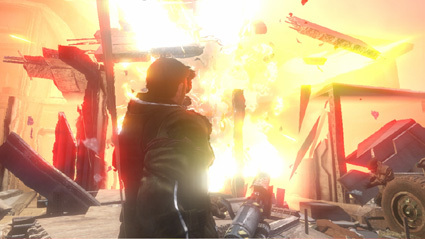 The combat is a tad tricky in the game due to the third person view, however it is quite fair and balanced and you do need to use the gaming environment to assist such as cover. You have access to a variety of weapons, both from the Earth Defence Force and the Red Faction which allows for upgrades and new weapons from your base. Best of all, the rail gun returns in this game, allowing you to see your enemy behind walls... delicious! Of course, nothing is more satisfying than throwing a bomb onto an enemy truck and then blowing it to smithereens. Destroying buildings allows for some great creativity, whether you’re using the sledgehammer, sticky bombs or other weapons, it’s all up to the gamer to get in touch with their inner muse. Once you have completed the single-player game which takes around 15 – 20 hours of average gaming, it’s time for some multiplayer fun that offers the gamer a variety of different gameplay modes from traditional deathmatch to capture the flag. There’s also a twist to “chicken” which has the gamers hunting a particular player who is attempting to destroy key parts of the map. Thankfully the multiplayer aspect was not put in as an after thought and allows for a deep and meaning online experience. 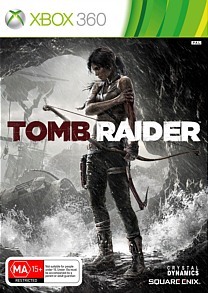 Graphically, I must admit that this is easily one of the most impressive games of the year, especially for this genre. 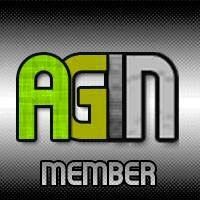 The graphics are clean and crisp, highly detailed and move with a decent frame rate. The star of the game are the indestructible environments as you destroy buildings with bricks, rubble and metal going everywhere. I’m still reeling by the very first time I saw Mars in this game, however almost as good as the graphics is the professional voice acting and brilliant soundtrack that just adds to the atmosphere of the title. 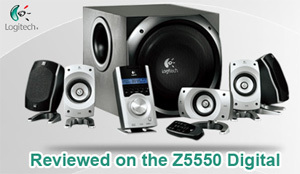 The sound effects truly RUMBLE through a surround sound system and sometimes you need to play this game loud. Final Thought? THQ and Volition should be commended for an outstanding game that not only compliments the series, however goes beyond its predecessors. With next generation graphics, brilliant gameplay and a story that actually makes you care, Red Faction: Guerrilla is an almost perfect game that takes us back to those classic games of the 90’s, however with modern soul and essence. Brilliantly addictive!